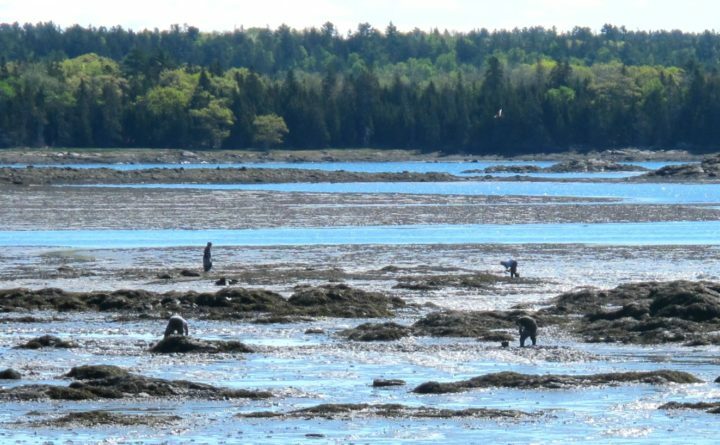 Marine harvesters dig for clams or worms in the tidal flats between Trenton and Mount Desert Island, May 26, 2016. A bill designed to address confusion over the boundaries of a national park in Maine is headed to President Donald Trump for his signature. Democratic Reps. Jared Golden and Chellie Pingree said the bill is intended to make sure clam and worm harvesters are allowed to continue working the mudflats around Acadia National Park. The bill passed the House of Representatives on Tuesday as part of a public lands package. Maine’s two senators, independent Sen. Angus King and Republican Sen. Susan Collins, have also worked on the effort. The measure allows the park to expand to accept a gift of 1,400 acres. Pingree said the legislation “states that clammers, wormers, and other traditional harvesters can continue working in the places where they have for generations.